A comprehensive alarm management and alarm notification software system from Exele for wherever data and events need to be monitored. Use TopView® with process and automation data and events, relational databases, MQTT, system performance and network ping response data. Generate audible alarms, send e-mail notification, SMS/text notification, voice call-out notification, MQTT messages, and SNMP traps. Plus, desktop and mobile apps to keep users connected to important data and events. TopView contains a robust notification engine supporting a wide variety of devices. This includes audible alarms, email, SMS/text, voice callout (VOIP/TAPI), pagers, and SNMP traps. If you need additional notification options, TopView allows you to write your own notification handler. Notification Messages can be fully customized to ensure that the delivered message is meaningful to each user. Many of TopView’s notification methods are bidirectional (email, SMS/text, voice callout), allowing the notification recipient to acknowledge the alarm and prevent escalation to others within the organization. 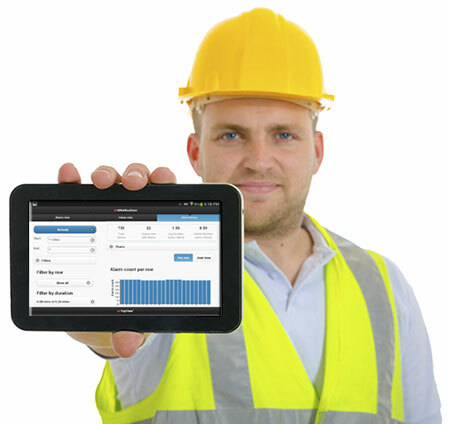 TopView allows users to access monitored data, alarms, and alarm history on both desktop clients and mobile devices. For desktop users, TopView’s real-time thin client allows users to view, hear, acknowledge, and shelve alarms. Views can be configured for each user and permission to acknowledge or disable alarms can be granted. In addition, the alarm history and interactive analytics provide insight into trends of alarm behavior. The TopView Mobile Web App provides access to values, alarms, and alarm history on all popular mobile devices including Apple iOS, Android, Blackberry, and Windows Phone. Nothing complicated to install or configure, and no installation required on the mobile devices. Desktop users can also access the Mobile Web App through their desktop browser. The value of alarm history is being able to improve your process and reduce alarms. TopView stores your alarm history and makes it available for internal reports and analysis as well as 3rd party products and tools. TopView’s built-in alarm reports can be schedule and emailed or created on-the-fly. Insightful alarm analytics exposes “bad actors”, alarm flooding, and periods of unusual alarm activity. Whether you need to monitor 50 items or 500,000 items, the same TopView product can be used. Our architecture allows the TopView Engine to run as one or many multi-threaded processes in order to balance the resources of the both the TopView machine and your data servers. TopView succeeds where other products fail which is one of the reasons why some of most data intensive companies rely on TopView to help them manage their alarms.